Simple, elegant & affordable business management. 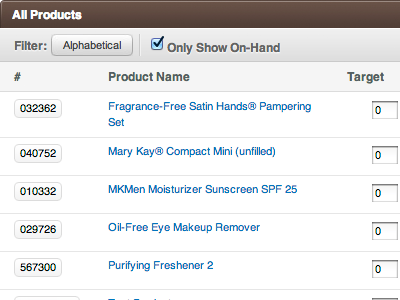 Pink Office provides a simple to use web & mobile app for rock star Mary Kay® beauty consultants. Use it to track, analyze and report on inventory, customers, bookings, sales, expenses & more. Giving you valuable time to grow your business! With Pink Office Mobile you can sell anywhere, anytime. 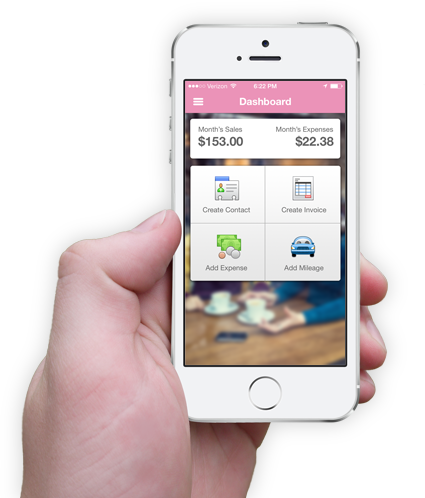 Create contacts, invoices, and track expenses and mileage. Also process credit cards with our ProPay support. The Pink Office Mobile app is free for our customers to use. 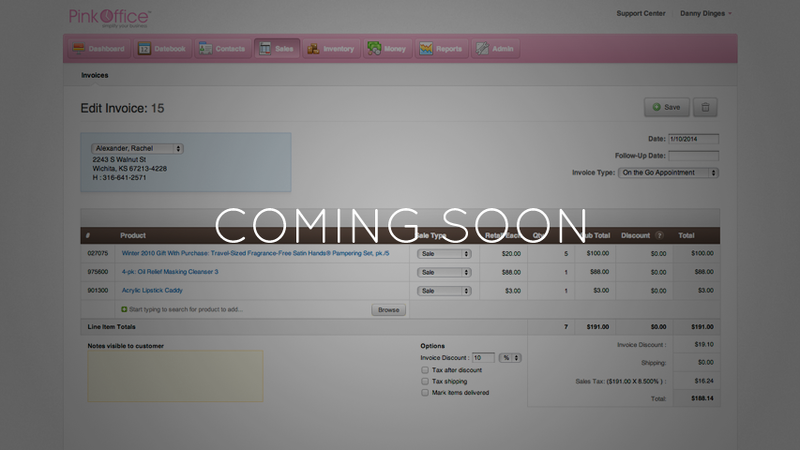 It's just another tool we offer to help you stay more organized and make more sales. Stay organized and always know what's on hand. With our inventory management tools you can keep accurate records of your products. 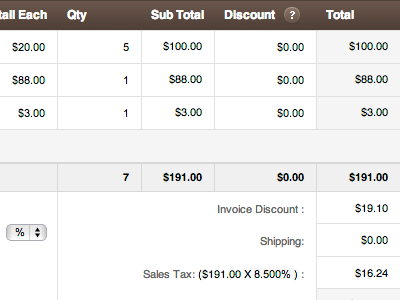 Import purchase orders, adjust on hand quantities, and much more. Our inventory system is powered by a FIFO record system allowing you to keep as accurate records as possible. Ready to sell some products? With our sales tools you can track your sales, create invoices, record deliveries and payments, email invoices to customers, and more. We offer several tools to help manage and increase your sales. 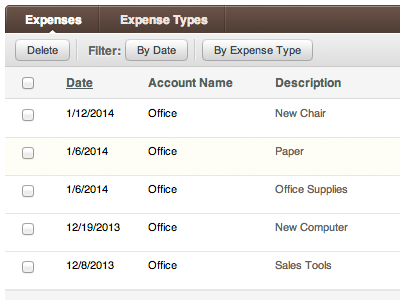 With Pink Office Mobile you can create invoices on the go. You can even take customer payments from your iPhone with our ProPay integration. Track all those business records that help you succeed. Easily track your expenses and receipts, track income like commissions, and even track the mileage on your car for that year end tax write-off. 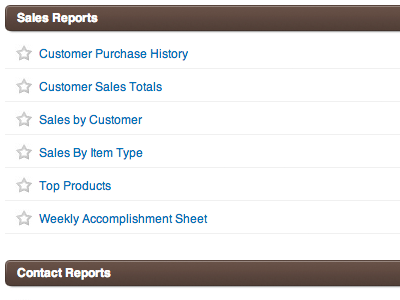 We have several powerful reports for you to choose from. From simple Profit/Loss statements, what items need ordered, mileage reports, and our weekly accomplishment sheet. Pink Office reports are designed to make your data easily accessible so you can get a quick view of different aspects of your business. Pink Office packs a lot of power in a small package. You get all our features out of the box including our Mobile app for the iPhone. So you can stay organized in the office or in the field. * Quarterly and annual discounts available. The Client will be charged by credit card for use of Flourish, Inc. Payment will be charged by Flourish, Inc before the service will be made available online. Payments should be made online by credit card or debit card, and are automatically billed each month, depending on the terms The Client originally signed up for. In the event of any failure by The Client to make payment or arrange a credit card with available credit, The Client's access to Flourish, Inc will be removed until an appropriate payment method is available. Renewal of The Agreement and acceptance of any additional orders shall be at Flourish, Inc's sole discretion. Pricing for any renewal period is subject to change by Flourish, Inc from time to time. Renewal of the term will be continued automatically, unless The Client cancels service, in accordance with the Cancellation Terms. The Client may not resell, re-use, assign or transfer any of the images, data or programming code created for or associated with the Flourish, Inc, without written consent. Any attempt to resell, assign or transfer such data shall result in immediate termination of this contract, without liability to Flourish, Inc. Flourish, Inc shall have no liability for any failure or delay resulting from any governmental action, fire, flood, insurrection, earthquake, power failure, riot, explosion, embargo, strikes whether legal or illegal, labor or material shortage, transportation interruption of any kind, work slowdown or any other condition beyond the control of Flourish, Inc affecting service or access to data. The Client agrees to indemnify and hold Flourish, Inc harmless against any and all expenses and losses of any kind (including, without limitation, any claim of trademark or copyright infringement, libel, defamation, breach of confidentiality, false or deceptive advertising or sales practices) and /or any material of The Client to which users can access through the service. The Client will provide all necessary materials and information, in accordance with Flourish, Inc policies in effect from time to time including (without limitation) the manner of transmission to Flourish, Inc and the time prior to release of the service. Flourish, Inc shall not be required to publish any service that is not received in accordance with such policies. Although Flourish, Inc owns the data storage, databases and all rights to the Flourish, Inc application, we will never sell or share your client data with any third-parties, or contact your clients directly. We will also not utilize your data in our databases to market to your clients, advertise to, or contact them for any other means of profit. We respect the privacy of our subscribers, and the privacy of their client data. We retain the right to retain or delete data provided to us by you at our sole discretion. All contents of the service are subject to Flourish, Inc's approval. Flourish, Inc reserves the right to reject or cancel any client, at any time. The Client must either contact Flourish, Inc before the next billing period to cancel the service or cancel via the My Account tool in the application. The Client will not be billed for any cancellation. No refunds will be made on services already paid for, and service fees will not be prorated. No conditions other than those set forth in this Agreement shall be binding on Flourish, Inc unless expressly agreed to in writing by Flourish, Inc. The Agreement, (i) shall be governed by and construed in accordance with, the laws of the State of Kansas, without giving effect to the principles of conflicts of law; (ii) may be amended only by a written agreement executed by an authorized representative of each party; and (iii) constitute the complete and entire expression of the agreement between the two parties, and shall supersede any and all other agreements, whether written or oral, between the parties. Flourish, Inc will not sell, share, or rent this information to 3rd parties. 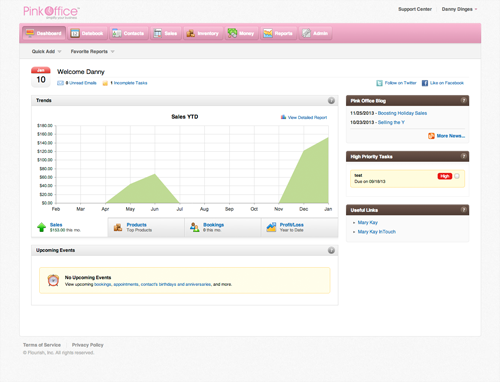 Flourish, Inc collects information from our users at several different points on our Web site to provide services and support related to the PinkOffice.com application service only. The privacy, security, and integrity of our Customers' data are our highest priority. Therefore, Flourish, Inc will not sell, rent, or trade any contact or account data stored in your PinkOffice account. Information stored by Customers in their PinkOffice account is available only to members of the Customer's group that are authorized to access the information. In order to use this Web site, a user must first complete the registration form. During registration a user is required to give their contact information (such as name and email address). This information is used to contact the user about the services on our site for which they have expressed interest. On the sign-up form we request information from the user. A user must provide contact information (like name and billing address) and financial information (like credit card number and expiration date). This information is used for billing purposes and to activate the Customers' account. If we have trouble processing an order, this contact information is used to get in touch with the user. We use IP addresses to analyze trends, administer the site, and track user's movements within the site. IP addresses and other information collected in these log files is not personally identifiable; it shows us generically and in the aggregate how our site is being used. The following information is gathered in the log files: IP address, referring URL, time zone, browser type, operating system, files accessed, and errors generated. All this information is gathered and used only by Flourish, Inc, to help us analyze usage and trends to improve our application. This Web site contains links to other sites. Please be aware that we at Flourish, Inc, are not responsible for the privacy practices of such other sites. We encourage our users to be aware when they leave our site and to read the privacy statements of each and every Web site that collects personally identifiable information. This privacy statement applies solely to information collected by Pink Office on www.pinkoffice.com. When our registration/order form asks users to enter sensitive information (such as credit card number and/or social security number), that information is encrypted and is protected with the best encryption software in the industry - SSL. To learn more about SSL, visit this link: https://en.wikipedia.org/wiki/Secure_Sockets_Layer. In addition to utilizing SSL encryption to protect sensitive information online, we also do everything in our power to protect user information offline. All of our users' information, not just the sensitive information mentioned above, is restricted in our offices. Only employees who need the information to perform a specific job (for example, our billing clerk or a customer service representative) are granted access to personally identifiable information. Our employees must use password-protected screen savers when they leave their desk. When they return, they must re-enter their password to regain access to the information previously viewed. Furthermore, ALL employees are kept up-to-date on our security and privacy practices. Every quarter, as well as any time new policies are added, our employees are notified and/or reminded about the importance we place on privacy, and what they can do to ensure our Customers' information is protected. Finally, the servers that are used to store personally identifiable information are kept in a secure environment, behind a locked cage. We send all new users a welcome email to verify their User Login, and User Password. Established users will occasionally receive information on products, services, and special deals. Out of respect for the privacy of our users, we present them with the option to unsubscribe from these types of communications. If a user's personally identifiable information changes (such as a zip code), or if a user no longer desires our service, we will endeavor to provide a way to correct, update, or remove that user's personal data provided to us. This can usually be done in the user's profile or by contacting Customer Support. Users who no longer wish to receive promotional materials from PinkOffice may opt out of receiving these communications by clicking the "unsubscribe" link in the e-mail.